This is for a Show Demo Scope, limited amount - looked at never used... 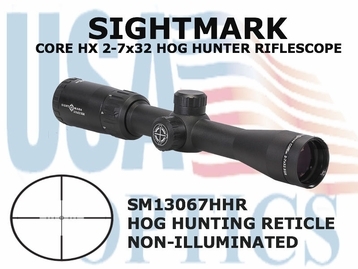 Designed specifically for hunting feral hogs, the Sightmark Core HX 2-7x32 HHR Hog Hunter Riflescope has been crafted to offer versatility in the field. With a 2-7 magnification and a 32mm objective lens, this reliable optical system offers a wide field of view for fast shooting on moving targets. 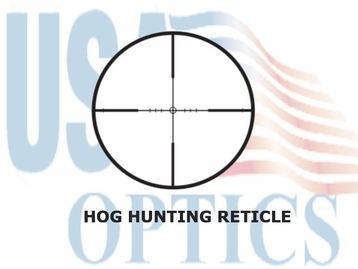 The range-finding, hog reticle allows hunters to calculate distances for selecting the perfect shot. Constructed from a single piece of durable aircraft-grade aluminum, the 2-7x32 HHR works with a variety of calibers. Engineered to withstand the most punishing conditions, the durable Hog Hunter Riflescope is shockproof, fogproof, and waterproof.